You know when you find those authors that are just your speed? You read their work and you just know that someone who writes and thinks that way is the kind of person that you could be friends with? 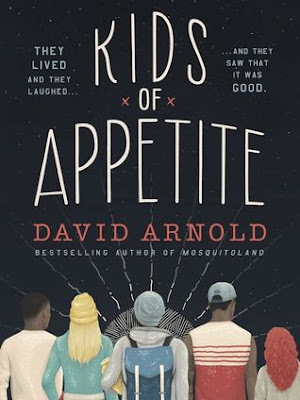 After reading Mosquitoland and Kids of Appetite, I’m convinced that David Arnold’s mind works in such a way that I will always enjoy what he writes. Arnold just secured his spot on my auto-buy author list under the title "Super Racehorse"
I’ve seen a lot of people calling “Kids of Appetite” quirky, and I guess that’s a good word for it. But for me, reading KOA was like hanging out with my very best friends and us saying all the weird things immediately as they come into our minds and everyone just getting it. Does that make sense? Maybe to me it was more a feeling than anything solidly definable. One of the most interesting parts of KOA, is that the main character, Victor, has Moebius syndrome. I watched a Youtube video made by Arnold of actual people with Moebius syndrome that he interviewed and worked with to create Vic’s character, and it defines this story in a really powerful and uplifting way. It was a refreshing point of view and movingly real. Basically reading about Vic and his thoughts and experiences reminded me to be kind and to be human. KOA alternates between two points of view: Vic and Mad. And between the two of them unfolds an adventure, a murder mystery, and a friendship based on something "old-new". If you’re looking for something off-beat, heartfelt, with good humor, and let's just say it--kind of random and weird, I recommend this! Loved it!